As a young boy, my favorite playground was the large tract of woods behind my house. Port Angeles was a lumber town, with five mills busy turning Douglas fir into paper and lumber. My neighbors were loggers who cut the tress or drivers who transported the huge logs to the mills. The huge forests of the Olympic Peninsula were a magnet for my imagination. Only later did I see the devastation that clear-cut logging created. I remembered my childhood fascination with the forest as I started my four-day solo backpacking trip in Rocky Mountain National Park last week. 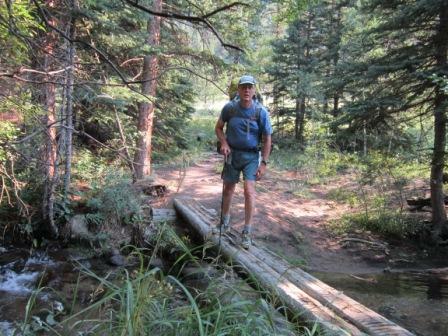 Since I wanted to do a loop route, I started from Cow Creek trailhead and headed north along the North Boundary Trail. I normally see the mountain forests as a transition zone that I quickly want to ascend so as to reach the open alpine areas with their vast vistas. For me, the forest was only a prelude to the main event. Yet I knew that my first day would remain in the forest. The North Boundary Trail ascends three ridges, each time descending to a mountain stream. The constant up and down challenged both my legs and my lungs. There were a few open meadows where one could see the higher peaks to the west, but mostly it was the forest that surround me. I yearned for the high alpine country ahead. During my trip I was reading Baptized into Wilderness: A Christian Perspective on John Muir by Richard Cartwright Austin. In the book, Austin emphasizes Muir sensuous emersion into the wilderness. Muir became present to the trees, birds, insects, life of American wilderness, experiencing God in the midst of all of it. Muir suggested that the path to the Spirit is not away from the world, but deeper into the world, deeper into communion with nature and with the primary forces where is Spirit is lightly clothed. Probing the simplest elements to discover their full character and vitality, he developed an incarnational understanding of God’s personality incarnate in Jesus (p. 25). God’s presence was all around me, in the beauty of the tall lodge pines and the tiniest of mushrooms. Could I simply open my heart and mind to experience the wonder and beauty of God’s creation? Lord Jesus, open my heart to see your beauty all around me. 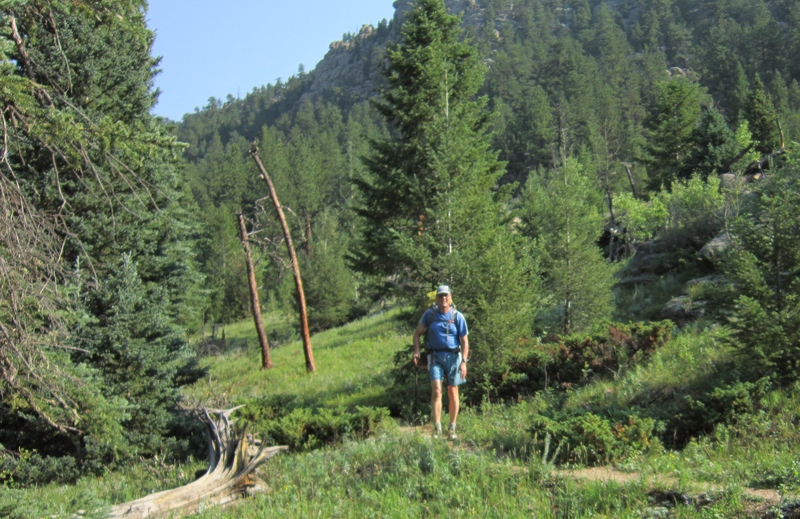 This entry was posted in Beginnings, Bible, Uncategorized and tagged Forest, John Muir, Rocky Mountain National Park, spirituality, Wilderness on August 17, 2012 by Pastor John Keller. I can feel the wonderful forest when I read your words. there’s nothing better. Safe travels, John. We miss you!